The words aspirational and Corolla don’t often appear in the same sentence. No harm, no foul — that’s not been the Toyota Corolla’s mission during its four-plus decades of existence. Offering a winning combination of inexpensive and reliable transportation has helped the Corolla become the best-selling car of all time worldwide, surpassing Ford’s Model T and the Volkswagen Beetle along the way. But in today’s SUV-crazy marketplace, the path to winning back buyers to the passenger car fold requires some new thinking: an aspirational Corolla. So for 2019, Toyota is rolling out a Corolla hatchback that's all-new from the ground up. It shares virtually nothing with the Corolla sedan or with the Corolla iM hatchback it replaces. It competes against five-door versions of the Honda Civic, Mazda3, Ford Focus, and Hyundai Elantra. 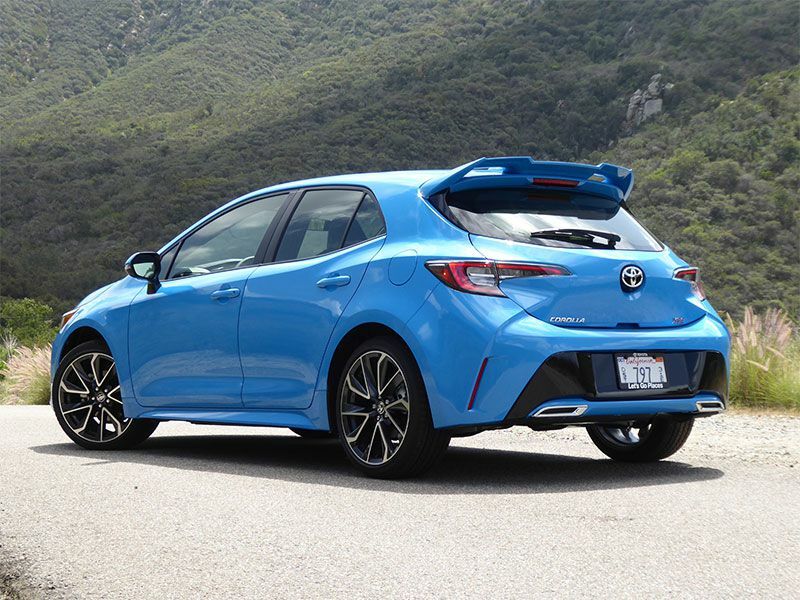 Longer, lower, wider, and more aggressive-looking by any measure, the 2019 Toyota Corolla Hatchback sports more power, updated infotainment, and a full suite of advanced safety systems — all standard. Prices have yet to be announced but expect prices to start just over $20,000. The Hatchback has two trims. 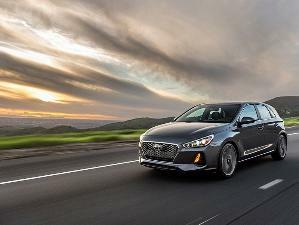 The base SE includes all-LED exterior lighting, a leather-wrapped steering wheel, an Entune 3.0 6-speaker stereo with an 8-inch infotainment touchscreen, Wi-Fi, Bluetooth, automatic climate control, and 16-inch alloy wheels. 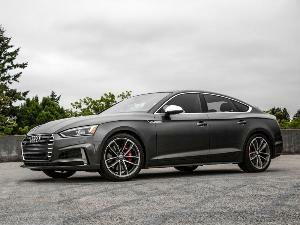 The XSE adds standard niceties such as leather upholstery, a power driver’s seat, heated front seats, SiriusXM, HD Radio, blind-spot monitoring, LED fog lamps, 18-inch alloy wheels, and a larger 7-inch driver information display. And just for grins, the big roof-mounted rear spoiler you see here in the photo is available as a dealer-installed accessory. Backing up the Corolla Hatchback's new dynamic look is a new emphasis on driving fun. And one of the best ways to move the fun meter is more power. An all-new "Dynamic Force" 2.0-liter four-cylinder engine provides 168 horsepower and 151 lb-ft of torque. 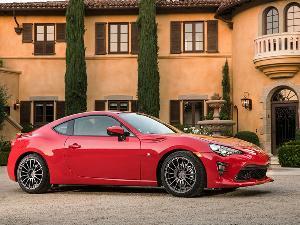 That's 22 percent more power and 20 percent more torque than the old Corolla iM's 1.8-liter four-cylinder. The new engine offers good response across the engine speed range, a mixture of willing low-end grittiness and overall refinement that’s appealing — never intrusive — and more class-competitive. 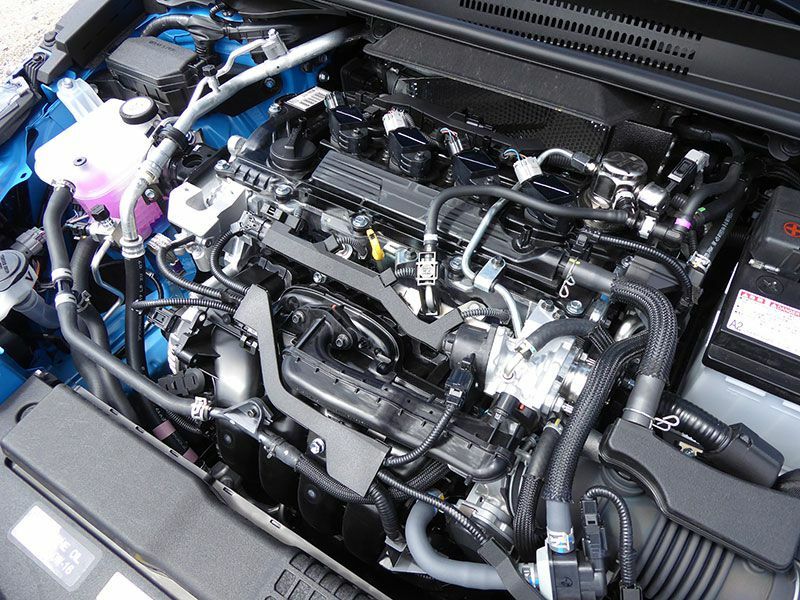 The engine features Toyota’s innovative D4-S fuel-injection system that uses both direct- and port-fuel injection to balance power, fuel economy, and emission-control missions. It also employs Dual VVT-i (dual variable valve timing with intelligence) with electric control on the intake side. The major takeaway is exceptionally well-rounded performance whether you’re just cruising around town or hammering down the freeway. EPA fuel economy estimates have not yet been announced but expect numbers somewhere between the outgoing Corolla iM’s 27-28 mpg in the city/35-36 mpg on the highway and the Honda Civic’s 29-31 mpg city/38-40 mpg highway. The 2019 Corolla Hatchback debuts two new transmissions to match its new engine. Most buyers will pick the "Dynamic Shift" automatic, which combines the best attributes of traditional automatic transmissions and continuously variable automatics, or CVTs. Toyota incorporated a hard first gear into a CVT to provide much better low-end response when accelerating from a stop. The rest of the time, the CVT functions normally with a large range of variable ratios seamlessly selected based on engine speed, road speed, road load, and so forth to maximize fuel efficiency. That is, unless you engage the Corolla’s standard Sport Mode or operate the steering wheel shift paddles. These put you in control of 10 simulated gear steps for more extra driving fun. 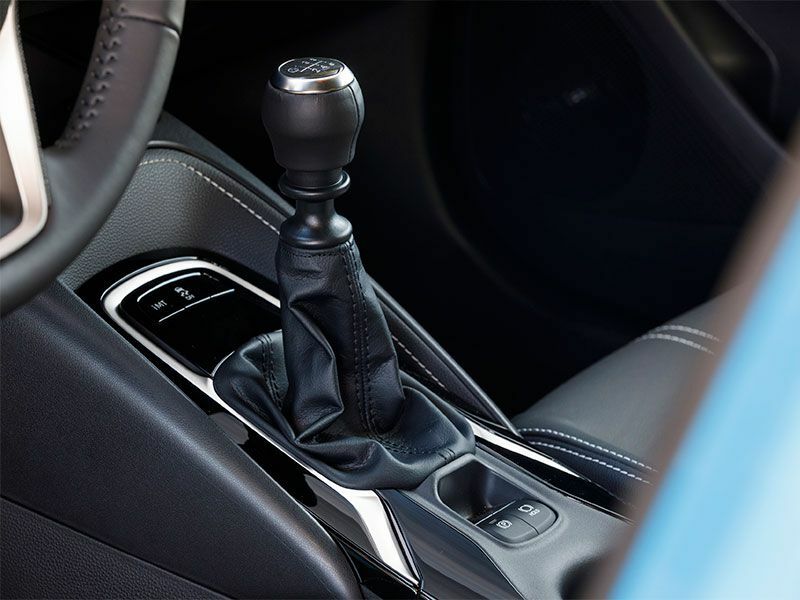 If you get the Corolla Hatchback's manual transmission, Toyota provides you iMT mode: a driver-selectable setting standard that makes you a smoother, better, more-artful stick-shift driver. Its software figures out just the right amount of throttle to match engine and input shaft speeds for a seamless shift — no jerks, clunks, bucking, stalling the engine, or slipping the clutch. Downshifts are rev-matched, and starting out, iMT delivers the optimum amount of engine torque to make for a smooth clutch take-up and release. You'll quickly wonder why someone didn’t put this in cars sooner, like antilock brakes. In another bonus, Toyota doesn’t restrict manual-transmission availability to just the base trim like many other carmakers do. 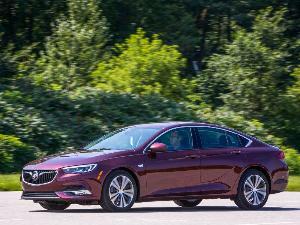 So even if you want many of the niceties the uplevel XSE model offers such as leather seats, 18-inch alloys, a power driver’s seat, and so on, you’re still not forced to get the automatic transmission. Go ahead and pinch yourself. I know I did. This is a Corolla interior? Yes. 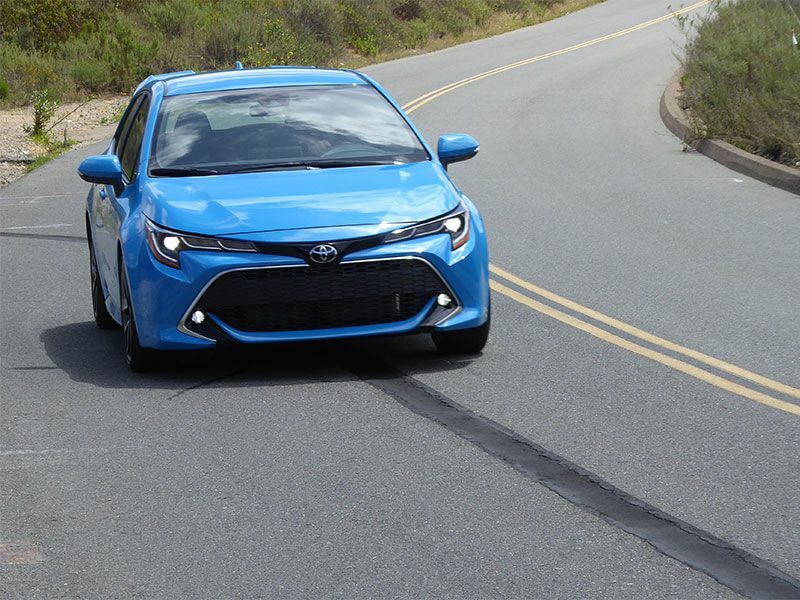 With the 2019 Corolla Hatchback, Toyota is upping the game with improved materials, textures, and technology. Sometimes less is more. The new cabin layout is clean and modern, with greatly reduced button and switch clutter. A distinctive 8-inch infotainment touchscreen holds court center stage. There’s a quality vibe to what you can touch and feel — rather than cheap-looking hard plastic. The top and front face of the dash, upper door panels, and door and console armrests are generously padded. The front seats are especially comfortable; the bottoms are padded in all the right places with just enough support, while the seatbacks sport torso wings that hug occupants without getting too personal. 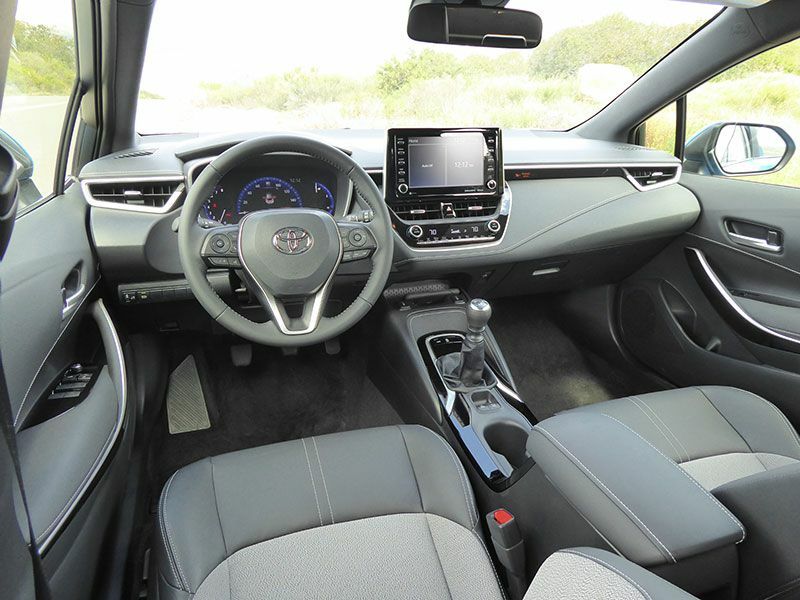 All 2019 Corolla Hatchbacks roll with a standard 8-inch infotainment touchscreen. Where some carmakers offer a tiny screen on all but the top model, the “base” SE trim includes plenty of goodies. 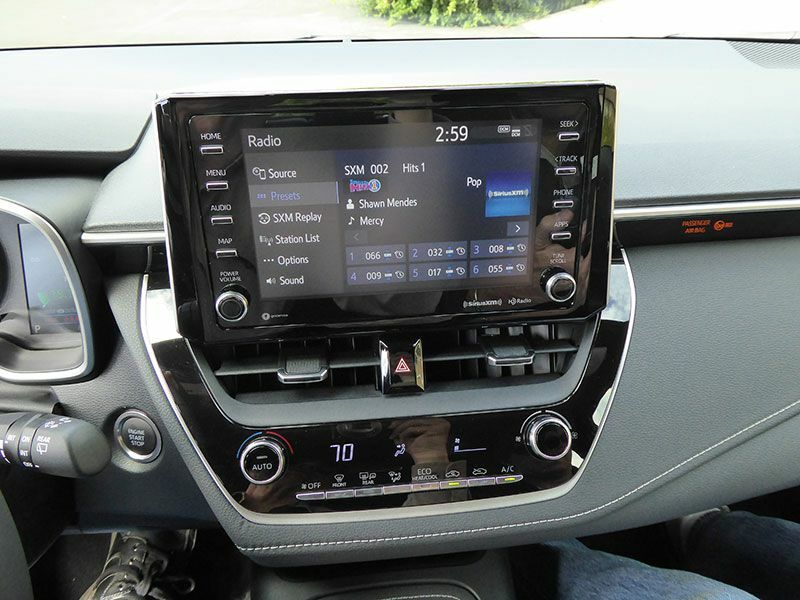 There's a large monitor with an AM/FM audio system with WMA/MP3 playback, Bluetooth, Wi-Fi by Verizon, Scout GPS, Siri Eyes Free and Apple CarPlay compatibility, Amazon Alexa connectivity, weather and traffic information, and a host of other services via Toyota's Entune 3.0 App Suite. Moving up to the XSE trim adds SiriusXM with Cache Radio, HD Radio, and Entune 3.0 Connected services. Optional on the XSE is a JBL premium audio system with embedded navigation, point-of-interest search, and other features. Alas, the Corolla Hatchback still doesn't support Android Auto — yet. The Corolla Hatchback has 18 cubic feet of luggage space behind the 60/40 split-folding rear seat — capacity rivaling a full-size sedan's trunk. 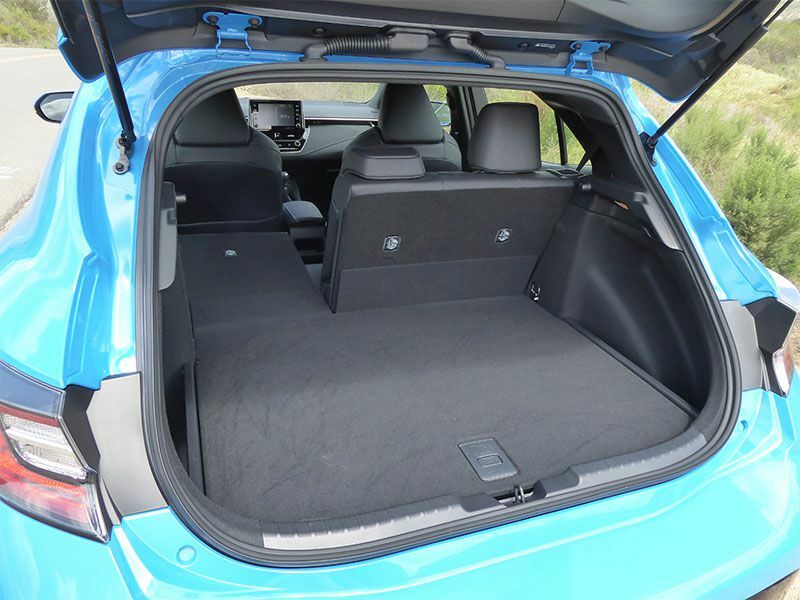 The seat folds nearly flat, which doubles the car's cargo capacity stretches out to accommodate longer items. If you want to chauffer basketball players in the rear seat, stick to the Corolla sedan, which has one of the roomiest back seats among compact cars. The Corolla Hatchback can also fit lankier adults in the rear, but only if they enter into binding arbitration with the front-seat inhabitants and slide the front seats forward a bit. The Corolla hatch’s new lower-mounted engine drops the hood line. This lowers the line of sight and, together with lower front hip points, helps the car's center of gravity feel low. 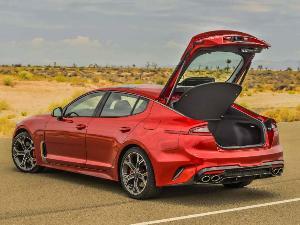 A stiffer new structure — and its front MacPherson struts and rear multilink suspension — provides good body control over road undulation. Toyota also tuned the shock absorbers to handle dips and moguls with minimal bobbing up and down. Both 16- and 18-inch alloy wheels are offered, but even with the XSE model's 225/40R18 all-season tires, impact harshness is never an issue. 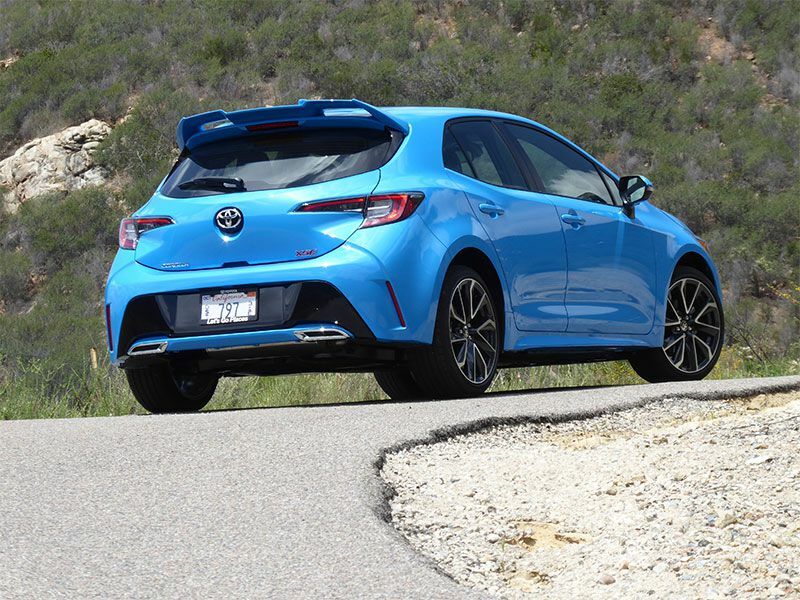 The Corolla Hatchback manages to deliver a good balance of handling and ride quality — it's responsive and fun to drive, but not harsh or darty. The electric-boosted rack-and-pinion steering has a fairly quick ratio with light effort and good on-center feel, but it’s never nervous or twitchy either. A stiffer steering column and intermediate shaft help deliver a more linear steering feel. Toyota enhanced highway-speed stability with a longer wheelbase and a rear suspension geometry that dials in a small amount of rear toe-in when the steering wheel is turned. 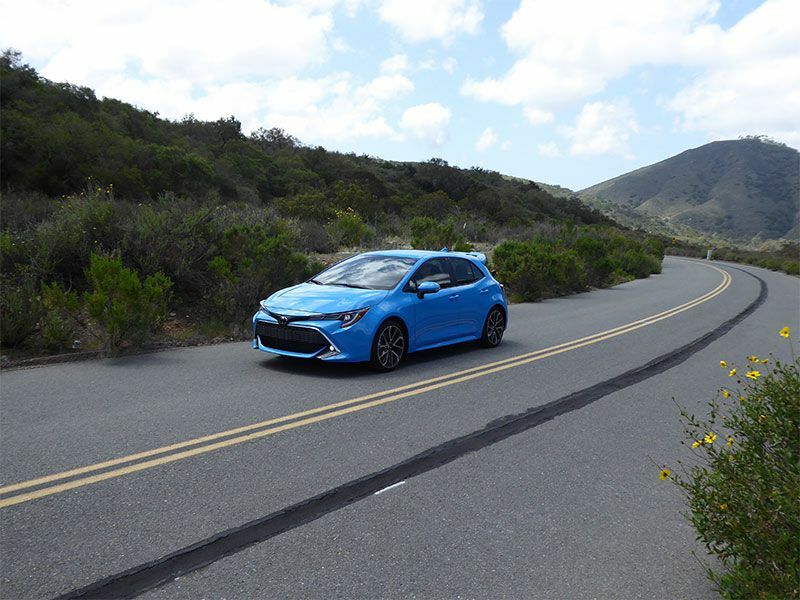 The new Corolla Hatchback is equipped with a suite of standard active safety systems called Toyota Safety Sense 2.0, and it's second to none in the small-car segment. In fact, the Corolla hatch’s standard safety features best those offered by some luxury automakers. Unlike some other brands that offer advanced safety tech only on the top-of-the-line trim or in a pricey extra-cost package, Toyota throws in the whole kitchen sink here on both the base SE and uplevel XSE models. Standard equipment includes a speed-reducing pre-collision system that can now also detect cyclists or pedestrians in low-light conditions; adaptive speed control (with full stop-and-go capability on CVT models); road sign assist; automatic high-beam control; a lane-departure warning with steering assist; and a new lane-tracing assist that can detect the edges of the road even in the absence of clearly painted pavement markings. 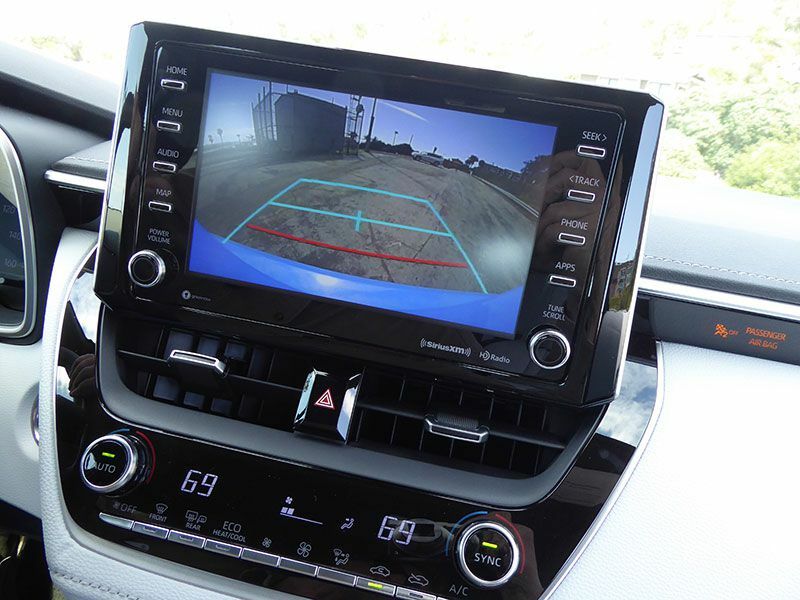 Blind-spot monitoring is an option on the SE and standard on the XSE. 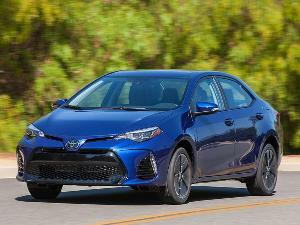 Toyota sold just over 20,000 Corolla iMs in 2017 compared to more than 308,000 Corolla sedans. A Toyota spokesperson indicated that around 20 percent of current Honda Civic sales are hatchbacks, and Toyota would strive to achieve the same result for the 2019 Corolla Hatchback. That would roughly triple Corolla Hatchback sales compared to the outgoing Corolla iM. There’s a good chance Toyota just might do that if enough of the under-35-year-olds sign up for it when it goes on sale this July. 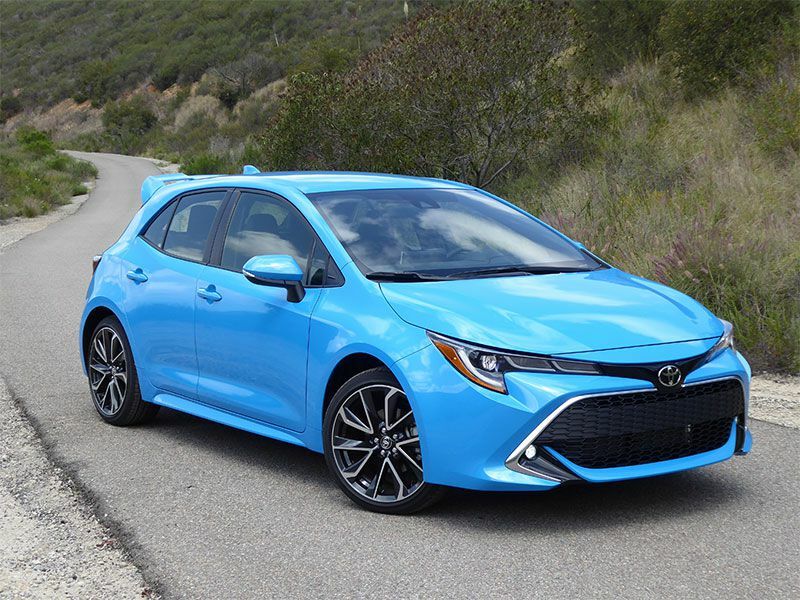 The 2019 Corolla Hatchback is a car with the style, performance, refinement, and features that will exceed many compact-car buyers' expectations.